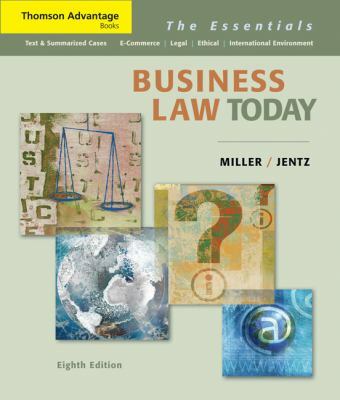 Interesting, clear, and applied, BUSINESS LAW TODAY: THE ESSENTIALS is your concise guide to the law and what it means in the business world--from contracts and secured transactions to warranties and government regulations. Easy to understand with an engaging writing style that is matched by vibrant visuals, BUSINESS LAW TODAY includes coverage of contemporary topics that impact not only the business world, but your life--from the USA Patriot Act's effect on constitutional rights to the national "Do Not Call" registry. Fascinating features and intriguing cases highlight the material's practicality. The text's companion website includes resources to help you study, such as sample answers to the end-of-chapter case problem features; videos clips for use with in-text video questions; Internet exercises; and interactive quizzes for every chapter.Roger LeRoy Miller is the author of 'Business Law Today: The Essentials', published 2007 under ISBN 9780324654547 and ISBN 0324654545.